Internet advertising in the United States slipped 5 percent in the second quarter as the recession extended the first slump in online marketing since 2002. 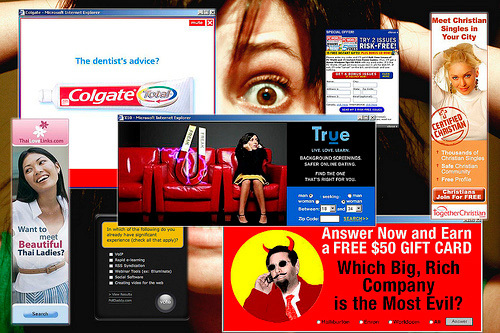 The $5.4 billion spent on Internet ads during the three months ending in June compared with $5.7 billion at the same time last year, according to data released Monday by the Interactive Advertising Bureau and PricewaterhouseCoopers. It marked the second consecutive quarterly decline in Internet advertising, the first time that has happened since the aftermath of the dot-com bust at the beginning of the decade. The fallout from that implosion resulted in eight consecutive quarters of falling online ad sales. For the first half of this year, Internet advertising totaled $10.9 billion, also down 5 percent from the same period of 2008. Nearly half that money has been spent on search advertising, helping to further enrich Google Inc., which controls nearly two-thirds of the U.S. search market. Google’s ad sales during the first half of the year edged up 4 percent. Those gains include ad revenue from outside the United States. Unlike the distress and doubt that gripped Internet companies during the Web’s last advertising downturn, the mood is more sanguine this time. That’s largely because this decline is perceived to be a temporary problem driven by the economic upheaval that has waylaid traditionally big ad spenders in the financial services, real estate and retailing sectors. With unemployment approaching 10 percent, online job listings also have plummeted. Internet ad specialists are confident revenue growth will pick up as the U.S. economy recovers and marketers ramp up their efforts to connect with consumers who are increasingly going to the Web for information and entertainment. The Web’s advertising prices also are generally lower than those offered in traditional media such as newspapers, magazines and TV. The shifting ad trends are the main reason other media are suffering much steeper advertising declines than the Internet. For instance, newspaper advertising has been falling for the past three years, including a 29 percent drop in the second quarter. Industry analysts doubt all the advertising that has migrated away from newspapers will return, even after the economy recovers. Both television and radio broadcasters have suffered smaller declines, though still in double-digit percentages.